Interested to know how does 2012, which is the Year Of The Water Dragon fare? Let's take a look at the Bazi Chart (Pat Chee in Cantonese) for 2012. For the uninitiated, a Bazi Chart is made up of 4 pillars (from left to right : Hour, Day, Month, Year) which contain 8 characters. The top row is known as Heavenly Stems, and the second row is Earthly Branches. Below these two rows are what we called Hidden Stems (not shown in above chart). 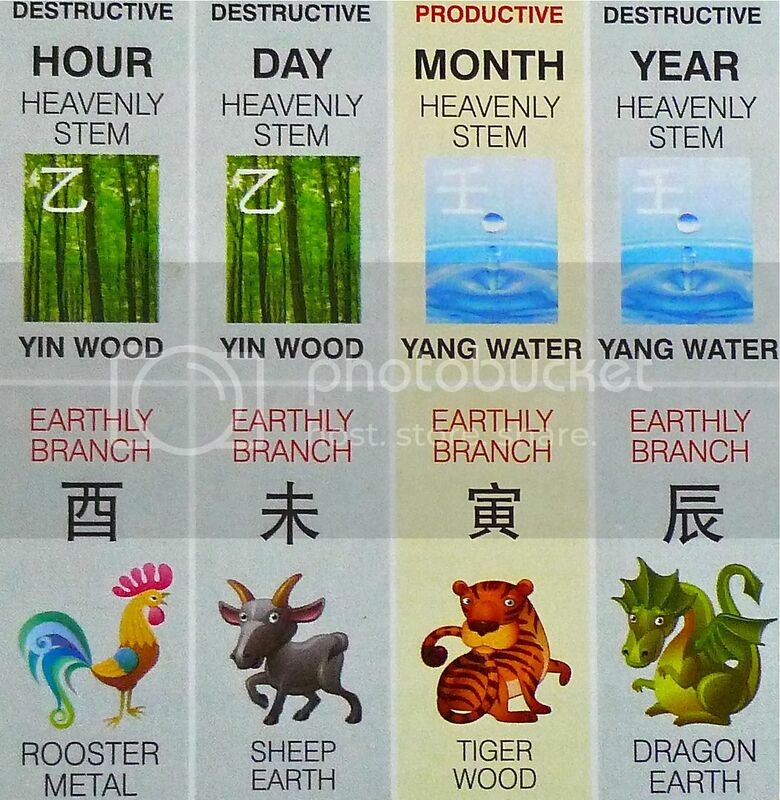 From the Bazi Chart above, 3 of the pillars are clashing (or destructive) - Metal destroys Wood in the Hour pillar, Wood destroys Earth in the Day pillar and Earth destroys Water in the Year pillar. Only ONE pillar (the Month pillar) is productive - Water produces Wood. This is much better than last year's Bazi Chart which saw all 4 pillars clashing! And they were serious clashes mainly between metal and wood! (Read HERE). As such, we can expect 2012 to be a better year. It definitely won't be a Doomsday year - that's quite certain, but some problems from last year would still continue in 2012. Notice the Earth and Water clashing in the Year pillar? This indicates landslides and earthquakes. It also indicates problems related to the kidneys. Personally, I interpret these two elements as Water flooding Earth so to me, there will be lots of flooding in 2012. This surely won't be good news for Malaysians as we are prone to both floods and landslides! The Metal and Wood clash in the Hour pillar indicates assassinations to older people, possibly elderly leaders. Lillian Too warned that everyone in a leadership position or in politics would be at risk and they should wear some kind of protection or protective amulets. Metal destroying Wood also indicates arm conflicts, possibly towards end of the year. Lillian Too said end of the year, starting from October is a dangerous time. As to what dangerous means, she did not elaborate. In fact, she mentioned that Spring and Summer are good times, but energies decline in Winter. So things don't seem to look very good towards end of the year. For a Bazi Chart to be good so as to indicate a good year, it must have all five elements present. But if you look at the chart, you will notice one element - Fire - is missing. This suggests lack of intelligence and creativity to prevail in 2012. Since fire is missing from the chart, Lillian Too suggested that we counter it by wearing more red colour (red indicates fire) clothes this year and switching on the lights and keeping our houses bright. Do not wear black, unless you match it with something bright and for the ladies, do not carry black wallets. So yes, the best colour for 2012 is red. Red curtains and red cushions are good. Taking it one step further - why not paint your house and car red too? LOL! Overall, this year's Chart is not that bad actually. There is Water producing Wood - this brings growth luck which may lead to real economic turnaround. However, business is very competitive and will need good strategies and proper planning. The stock market will rise in March (during Spring) and reaches its peak in the Summer months. Wood-based industries will thrive. However, the market will slow down towards the last quarter of the year. Lillian Too warned that you should be out of the market by October. The presence of the 3 Celestial Guardians - Dragon, Tiger and Rooster (Phoenix) in the Chart brings strength and improvement. However to complete the 4 Celestial Guardians, Lillian Too advised everyone to get a tortoise, whether real live one that you place outside the house or the feng shui tortoise object that you place inside. 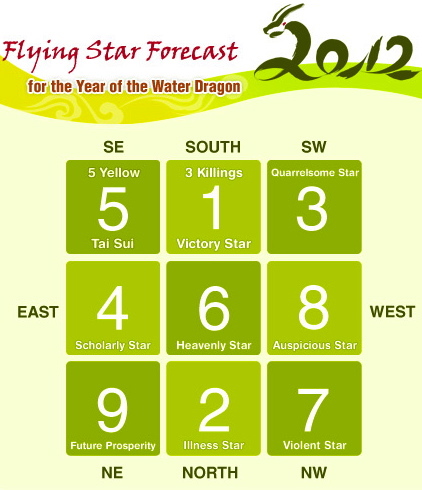 Besides the Bazi Chart, it is also useful to look at the Flying Star Chart for 2012. For the uninitiated, Flying Stars are 9 numbers placed on a Lo Shu square. Each of the numbers (or stars) represents different things and they rotate and change location every year. This is the reason why feng shui is never static. An area which is good feng shui this year can turn bad next year. And for this reason, we must always check our feng shui every year. The unlucky stars are 5 (Five Yellow), 2 (Illness Star), 3 (Quarrelsome Star) and 7 (Robbery Star). These stars need to be subdued. The good, auspicious stars are 8 (Wealth Star), 6 (Heavenly Star), 1 (Victory Star) and 4 (Romance and Scholastic Star). These stars need to be activated and enhanced. By using a compass and standing in the middle of your house, you will be able to determine which room or location in your house is being afflicted by the stars. So, if your bedroom is located in the Southeast sector, then you will be badly afflicted by the dreaded 5 Yellow this year. The 5 Yellow is the most dangerous of all the 4 unlucky stars. It brings serious misfortune including loss of wealth, illness and even death. Keep this Southeast sector as quiet as possible, with no renovation, digging, knocking or cutting to prevent triggering the star. To explain each star and its effects, and how to subdue or enhance them, would make this post too long. As such, it's better for you to get more detailed information HERE. Be sure to read it! I would also like to mention 2 very important afflictions which change location every year. Firstly is the Grand Duke Jupiter or Tai Sui. It is absolutely vital you do not face the Grand Duke Jupiter. This year, he is located in the SouthEast, or to be more exact, SouthEast-1. Don't know where is SouthEast-1? Look at the diagram below. Can you see SE1? 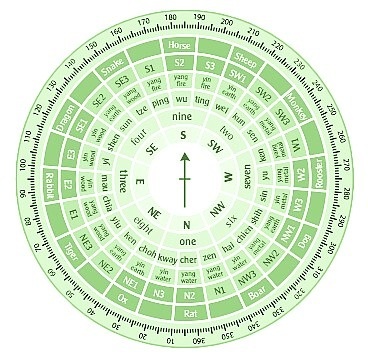 For your information, each of the 8 directions of the compass is further divided into 3 sectors. So for the North, you have North-1, North-2 and North-3. Likewise for SouthEast direction, you have SouthEast-1, SouthEast-2 and SouthEast-3. For guidelines on how to get your compass direction right, read HERE. Since the Grand Duke Jupiter is in SouthEast-1, do not sit facing this direction, especially when you work or when you are negotiating a deal. Also, do not renovate or disturb the SouthEast sector as it is both the Grand Duke Jupiter and the 5 Yellow sector this year - a double whammy! If there is only ONE important message you want to take away from this post, THIS IS IT!!! Don't say I did not warn you! From the compass diagram above, you can also see that those born in the year of the Dog are directly in conflict with the Grand Duke. As such, they should carry the Grand Duke talisman or amulet for protection. The second affliction I would like to mention is the 3 Killings. It is important NOT to sit with the 3 Killings behind you or you will suffer from 3 types of misfortune - loss of wealth, loss of loved ones and loss of good name. This year, the 3 Killings is located in the South. Facing the 3 Killing head on is good. This means sit facing South is good this year. Alternatively, you might want to place the 3 Celestial Protectors in the South sector of your house. Also avoid renovating and digging in the South. For those of you who are interested to know how your animal sign fare in 2012, I think I would just let Lillian Too help you out, complete with the remedies that you should have. Read her guide HERE. However, I still find it too generalized, so it's better to get her book Fortune & Feng Shui 2012 for your animal sign. It is much more detailed and I find it quite useful as it gives you guidance for every single month of the year! It also separates the luck of the same animal sign born in different years. This is important because a Monkey born in the year 1980 for example, does not have the same luck as another Monkey born in the year 1992! By the way, of all the animal signs, the Rooster will be having it really good this year. And Lillian Too is a Rooster herself! Of course not all Roosters will enjoy an excellent year because it still depends on the individual's Bazi Chart. So, the best and most accurate reading of your luck is still to get your personal Bazi Chart interpreted by an experienced Bazi consultant. To get your personal Bazi Chart, click HERE. In Part 3, I will share with you more tips and predictions from Lillian Too, including the best days to start work after Chinese New Year and how to stay safe in 2012.